I do have some great prizes though -- a sweet sterling silver pixie necklace, a maroon, gold, and brown tote bag I made, and a print copy of An Invitation: Ariel's Pet. Once I get the deadlines out of the way, I promise to get the contest up and running. A girl's gotta celebrate her birthday with more than just a vodka-mango smoothie and chocolate chip cookies, right? Don't forget... 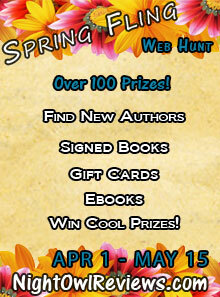 The Night Owl Spring Fling Web Hunt is still on until May 15th. Lots of prizes to win. There's also the items I donated along with my friend and fellow author, Jennifer Cole, to the Brenda Novak Online Auction to Cure Diabetes. Here's to a great summer and lots of reading!! I saw on FFNP Nest Classroom loop that you didn't have many followers, so I thought I would follow! You can always come check me out, too! Week 4 Writing Challenge Analysis - Glass Half Full - Half Way There!